(please note that our main season runs from 21st March to 20th October 2012, outside these dates please telephone for availability on 01720 422535). – Tariff £540 for the week fully inclusive. – Tariff £630 per week fully inclusive (shorter breaks may be available by arrangement). PLEASE NOTE – our ground floor two person apartment, Slippen, with private garden is now fully booked until the end of the season. Please note our SPECIAL DISCOUNT RATE for Early Spring 2013 which runs from Wednesday 20th March to Thursday 18th April 2013! Slippen is available before Wednesday 17th April 2013 at the discount spring tariff of £470 per week. 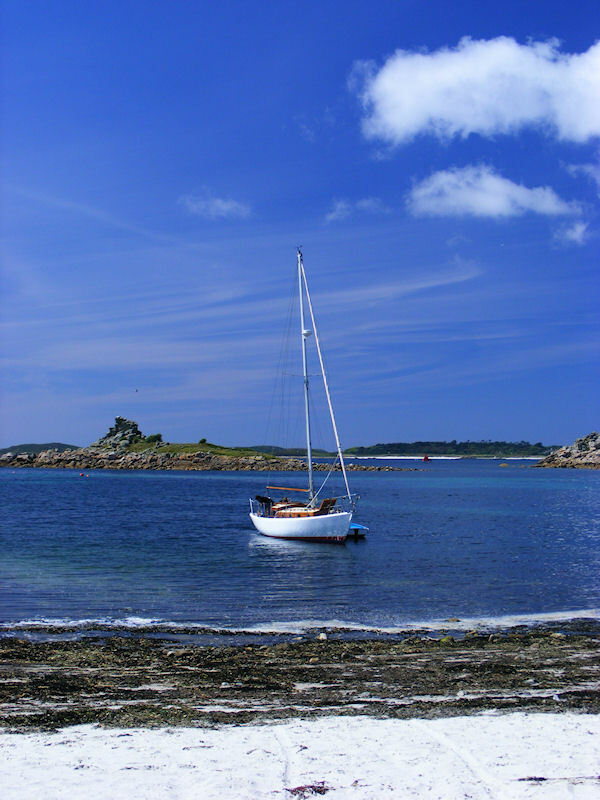 Serica is available before Thursday 18th April 2013 at the discount spring tariff of £470 per week. Golden Eagle is available before Thursday 18th April 2013 at the discount spring tariff of £520 per week. -arriving Thursday 18th April and departing on Thursday 25th April 2013. Tariff £570 for the week. – arriving Thursday 18th April and departing on Thursday 2nd May 2013. – Tariff £660 per week. – arriving Thursday 9th May and departing on Thursday 16th May 2013. – Tariff £745 for the week. – arriving Wednesday 22nd and departing Wednesday 29th May 2013. – arriving Thursday 30th May and departing on Thursday 13th June 2013. – Tariff £695 per week. – arriving Thursday 8th August and departing on Thursday 15th August 2013. – Tariff £695 for the week. – between Wednesday 21st August and Wednesday 28th August 2013. – between Thursday 28th August and Thursday 11th September 2013. – Tariff £570 per week. British International Helicopters will close its domestic helicopter routes between Penzance and the Isles of Scilly from the 1st November. The decision to close the route was triggered by legal action, announced today, taken by Tesco and two private individuals challenging the process undertaken by Cornwall Council and the Secretary of State when planning permission was granted for a Sainsbury’s supermarket on the current heliport site. BIH said this has prevented them from completing the sale of the land to Sainsbury’s and created too many uncertainties for the passenger service to continue. BIH says financial pressure on the company has been compounded by the falling number of visitors to the Isles of Scilly, while the majority of costs have risen. The company has entered a formal redundancy consultation process with its employees. It says it will honour all customer flights booked up until 31 October 2012 and anyone with a flight booked after 1st November will be given a full refund. Just to let you know that we’re in the process of moving our hosting so some of our websites and images are down at the moment. Hopefully they’ll be online again within the next 24/48 hours. I have a small but expanding collection of hippeastrums and they grace the biggest windowsill in the Gallery from March until June (sometimes even longer), greeting visitors with a colourful and spectacular display as they enter. Steve has always said he’d like to paint them but never got round to it …. until this year. 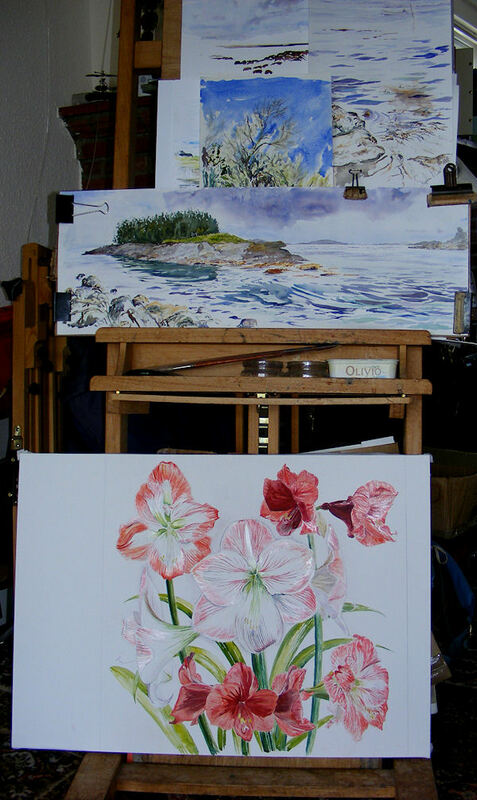 A couple of weeks ago, we had thick fog on Wednesday and Thursday so he decided to make a start on a large square painting featuring a selection of the hippeastrum blooms. He very rarely works in the Gallery itself but this is the sort of painting where he breaks his own rule of always working out of doors. 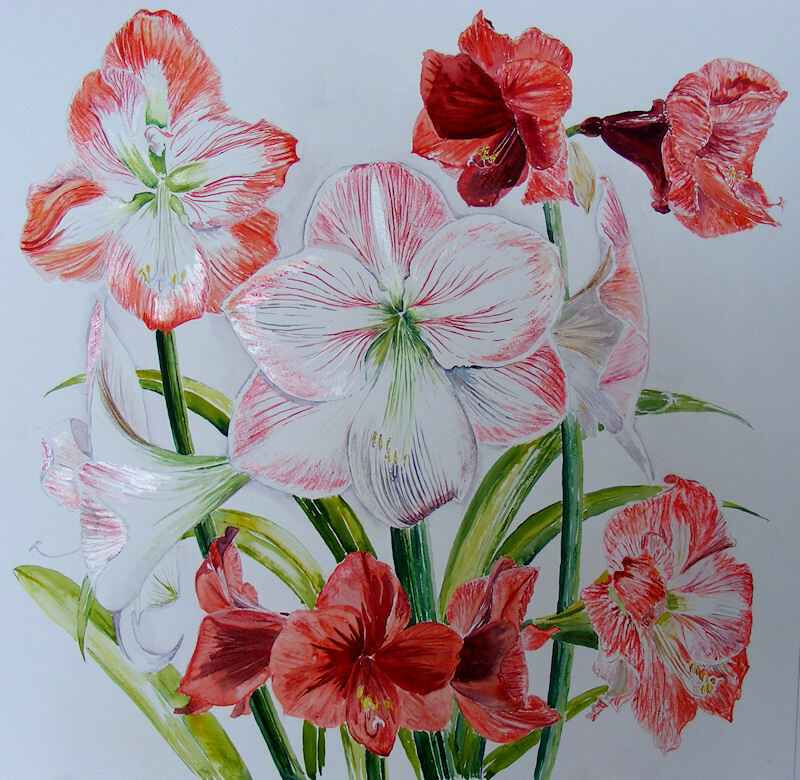 This work is a combination of watercolour, pastel and watercolour pencil to get the details and you’ll notice a ‘shine’ effect to some of the petals which he achieves by using gum arabic as an addition to the watercolour itself. A large mixed media painting by Stephen Morris, Glandore Gallery, Isles of Scilly, UK. Detail of the central bloom in Stephen’s large mixed media painting of hippeastrums, Glandore Gallery, Isles of Scilly UK. 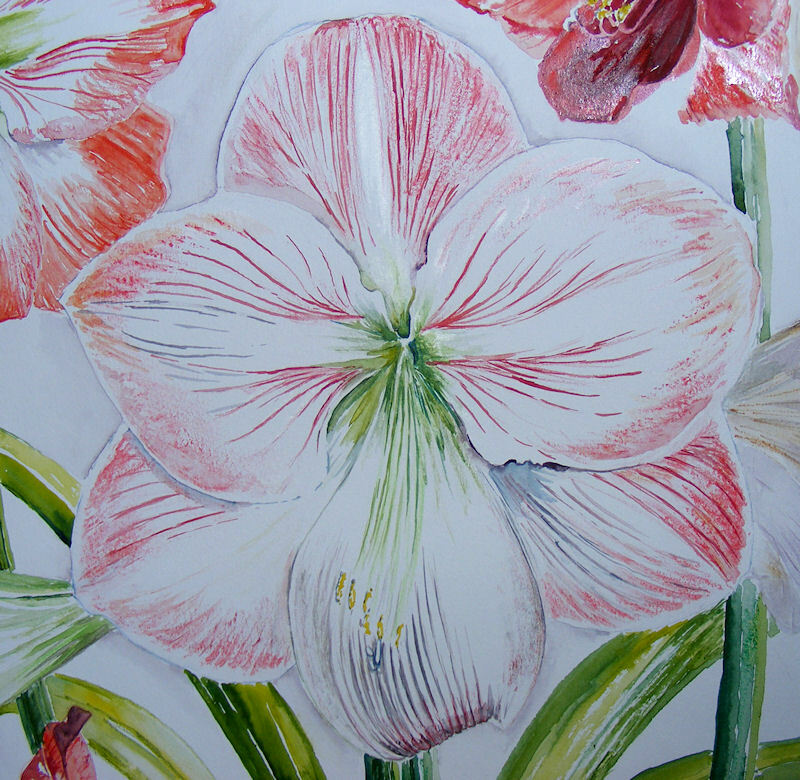 The large pale bloom in the centre of the painting is ‘Appleblossom’ which is a lovely hippeastrum with a delicious lily scent. The very dark red bloom top right and bottom is ‘Benfica’ and the red and white star bloom is unnamed but still spectacular in its anonimity. 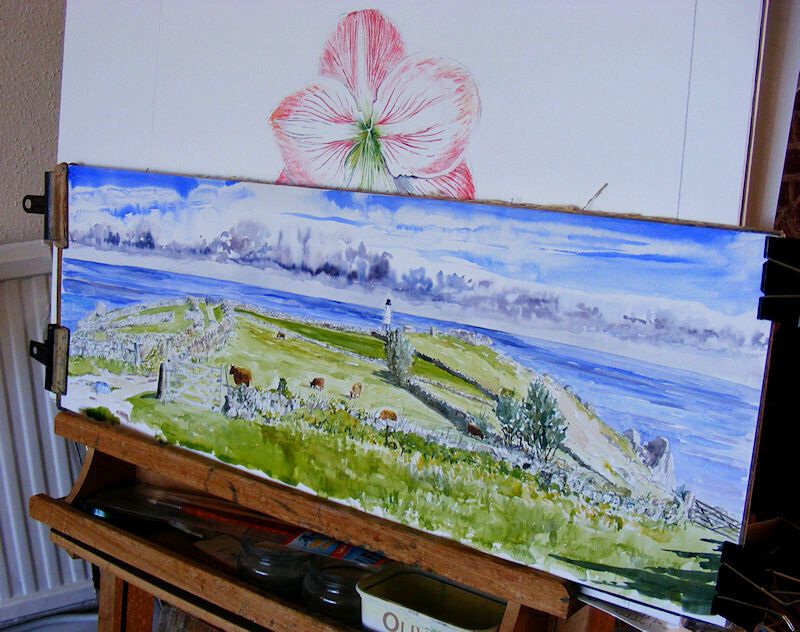 Also on the easel at the moment are several other paintings including a couple of loosely-worked beach paintings, one showing Newford Island, just off Porthloo Beach, at high tide when the sandbar is covered by the sea and the island is truly surrounded by water. Influenced by his recent work with acrylic inks, which are worked much more quickly and encourage a more impressionist approach, he is trying the same technique with watercolours and it is proving very successful. 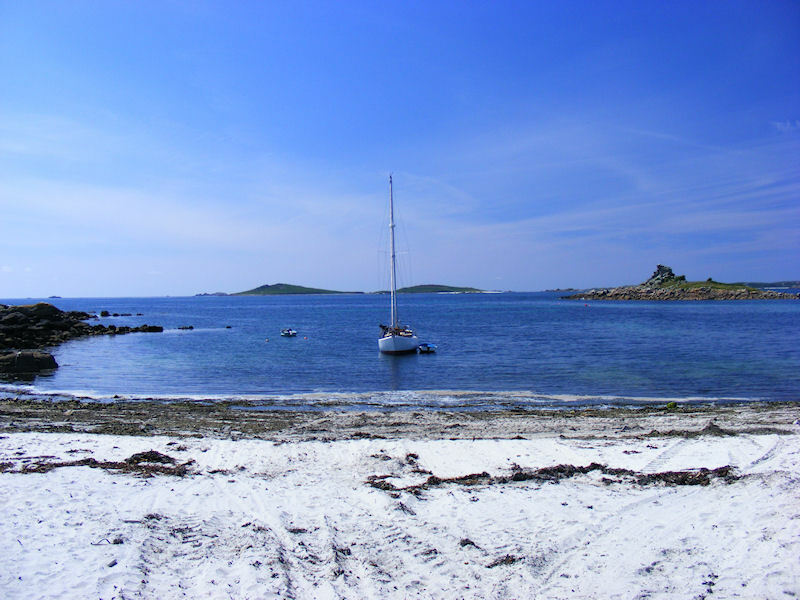 Today sees the official start of ArtScilly 2012 here on The Fortunate Isles. It’s the third year of the festival and it’s grown from somewhat shaky beginnings to a thriving and interesting week full of courses, workshops, walks and tours. 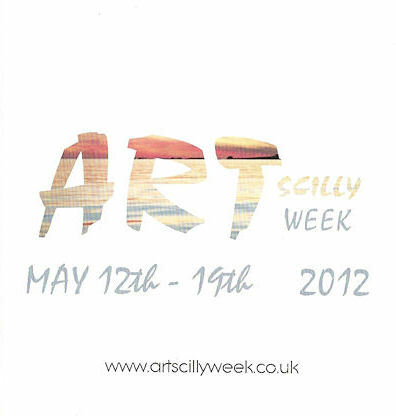 ArtScilly 2012 – a festival celebrating arts and crafts on the Isles of Scilly, UK. As before, the week kicked off with an Open Evening to meet the Artists, held at Phoenix Craft Workshops. “Drinks and nibbles will be served during the evening but it will be a very informal gathering and we look forward to meting you”. Many of the artists and craftspeople offering courses and workshops were present at the Open Evening and were able to chat with visitors and prospective participants. 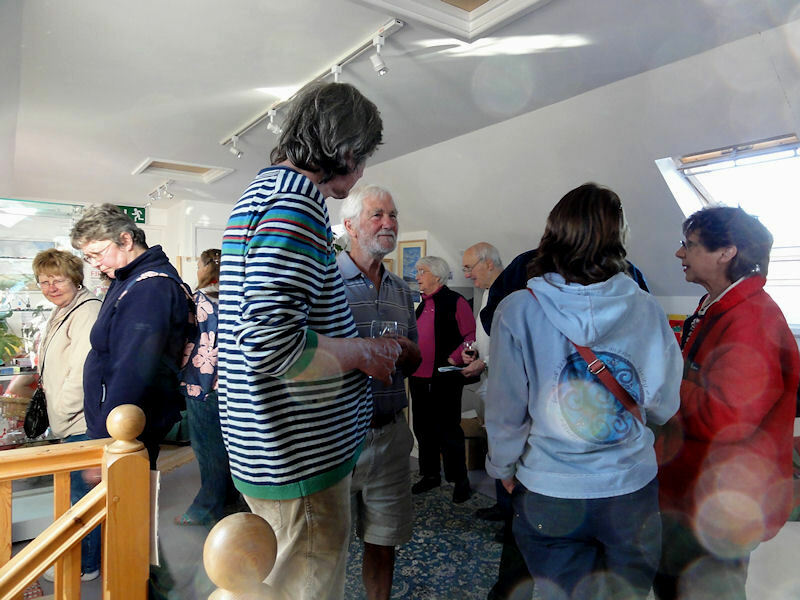 ‘Meet the Artists’, Open Evening at the beginning of ArtScilly Week 2012, Isles of Scilly UK. Tomorrow, Steve will be conducting a ‘Quick Watercolour Sketching from Life’ workshop which was already fully booked by last week. The weather forecast is excellent with sunshine and a light south westerly breeze so he should be able to take the participants out with their paints, paper and easels, although high tide is due at 11.24 so there might not be much beach at that point! I have my pre-order for a Victoria sponge cake as I did last year so they can all enjoy coffee, cake and chat when they return from their painting session. I must remember to print out some feedback forms because they were very useful last year in helping us plan for this year. Finally, Steve was out on Peninnis Head, working this afternoon, and completed a landscape-format painting that has taken three afternoons work. He tends to favour the taller portrait-format so this is one of his less common works. It has no title yet (if still untitled when purchased, the new owner will have the privilege of choosing its name) but it has some rather nice brown cows grazing and enjoying the wonderful warm spring sunshine in their granite walled field with Peninnis Lighthouse in the background. Just behind it is the beginning of a still-life painting he started a couple of days ago. The subject is one of my beautiful Hippeastrums called ‘Appleblossom’ which is currently in full bloom in the Gallery but he plans to add other Hippeastrums as they come into bloom, to make a composite arrangement. Cows grazing on Peninnis Headland, St. Marys, Isles of Scilly. So where are we right now at Glandore Gallery? Well, the Painting Week at the beginning of March was an enormous success and I’ll be putting some photos on our website so you can see what a great time everyone enjoyed. We were fortunate with the weather which, although windy, was also sunny so painting at Carreg Dhu and at Carn Leh, Old Town, was possible. Chris Garratt of Garratt Studio next door also provided oil painting sessions for the artists. We enjoyed a fabulous dinner at the Golf Club courtesy of Fay and Ramsey who really did us proud. Now we are planning for the next Painting Week here at Glandore Gallery. It will be 1st to 8th March 2013 with the possibility of a second week if we have enough interest. We spent a weekend in Amsterdam in February, celebrating Steve’s Mother’s eightieth birthday with family and friends from all over the UK and also from the US. 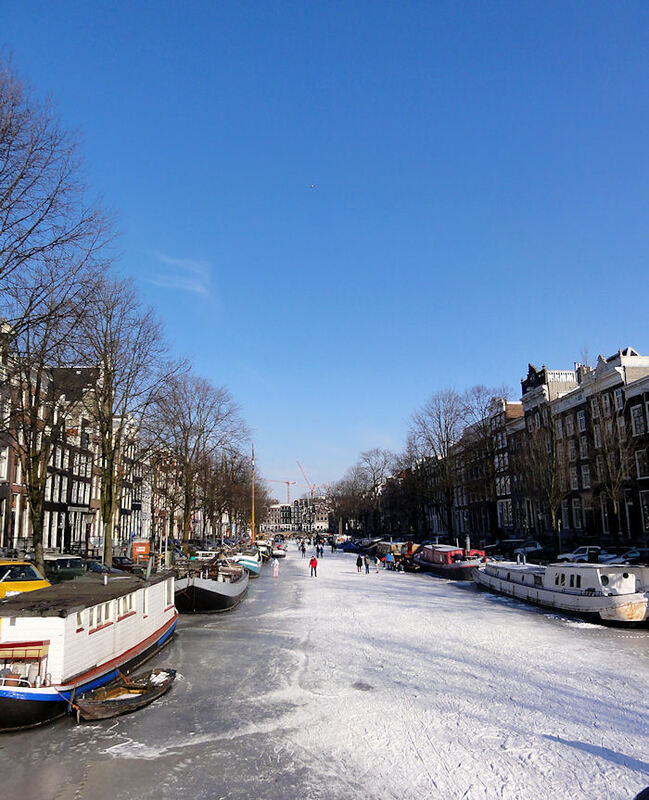 It was bitterly cold – in fact the canals froze over – so the Dutch were enjoying ice skating races and concerts ON the canals which were solid with thick ice. We visited the van Gogh Museum and Steve was overwhelmed with the magnificent artwork on display, especially being able to get close enough to examine the brushwork and techniques used. The Gigs were blessed with a great weekend despite the weather forecast being less than promising. The sea remained pretty calm, there was sunshine and blue skies, the racing was fiercely fought and very exciting with the final result being a Double win for Falmouth, securing both the Mens and the Ladies titles. But the new Scillonian gig, Tregarthens, came in a magnificent second in the Ladies Championship – well done to the team! 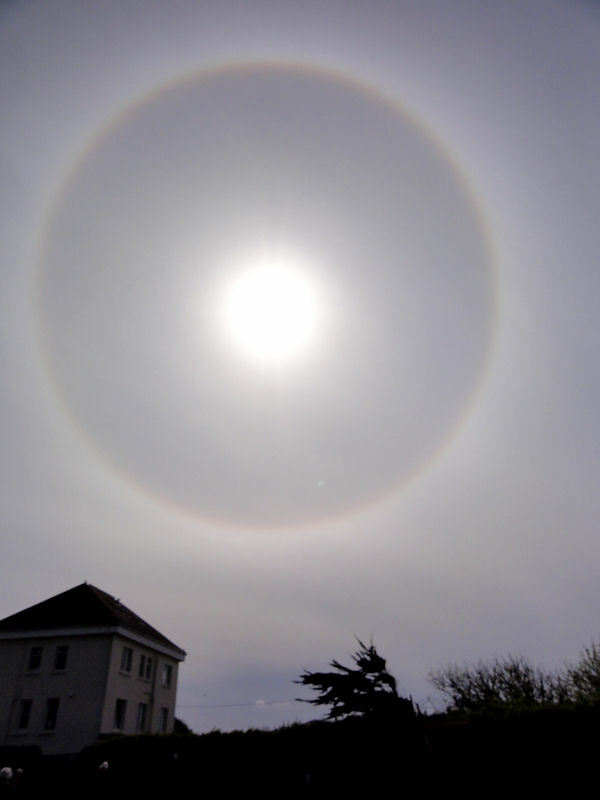 On the afternoon of the final, Scilly was treated to a rare display of a Sun Halo which Lois managed to capture using a compact camera. She didn’t expect to get a decent image but it really wasn’t too bad. You can see Glandore in the left foreground which gives an idea of the size of the Sun Halo – it was huge! The sun was circled by a rainbow and a pale milky corona which was very spectacular against the blue sky just a little hazy with high clouds. It didn’t last much more than an hour and disappeared as the clouds thickened enough to obscure the sun. I promise I’ll try to keep this blog updated better in future! We’d like to wish everyone a happy and peaceful New Year on this 1st January 2012. 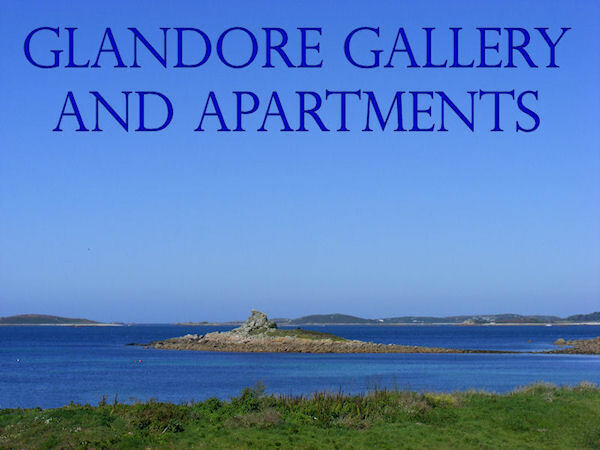 It was a busy year for Glandore Gallery and Glandore Apartments in 2011 and 2012 is shaping up to be another busy year as well. The ‘Islands of Sun and Ice’ Exhibition in Birmingham in November went really well with over half the paintings selling over the course of the four weeks. 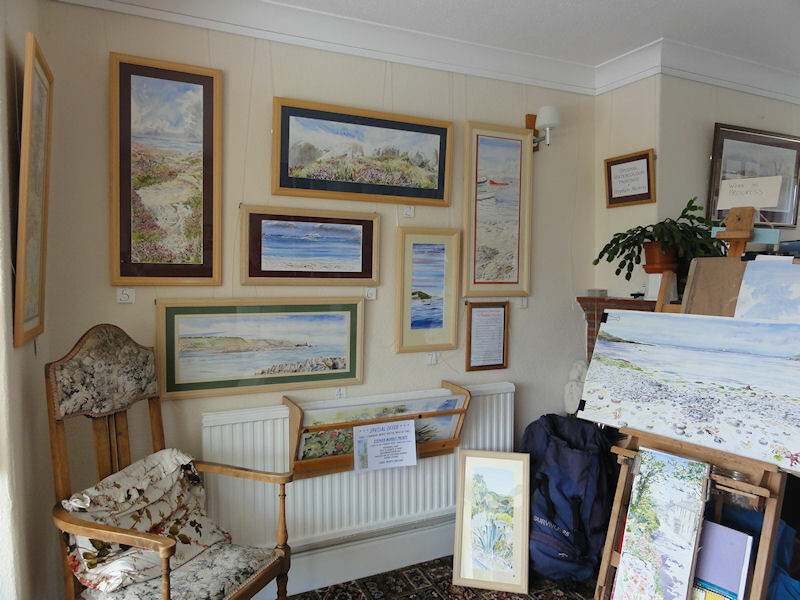 We’ll be bringing the remaining paintings back to Scilly later this month. The Painting Week is now fully booked so keep an eye open for news of the 2013 Painting Week! Today we had a cancellation for our Painting Week next spring. The participants were planning to celebrate their 70th birthdays while they were with us but there is going to be a big family celebration organised for them next March and they have had to cancel their booking with us for the painting week. Since we already had a list of about a dozen people who had expressed an interest in painting holidays over the last year or so, we wrote or emailed them the details and rough schedule. We provisionally put aside the week Friday 2nd to Friday 9th March 2012 as the Painting Week but, if demand was high enough, we would consider doing a second week running from Monday 12th to Monday 19th March 2012. That would give us a weekend in between to recover and regroup! We’ve joined forces with Chris Garratt of Garratt Studio who will be offering two morning of oil painting tuition and advice. Steve will be doing three mornings of watercolour painting and advice and there will be a full day off in the middle of the week for partipants to spend as they wish. Steve will probably go out painting himself on that day, if the weather is fine, and guests are more than welcome to join him if they wish. Forecasts, oracles and seaweed will all be consulted! We’re planning dinner for everyone on the day of arrival, probably at the Isles of Scilly Golf Course, which is only five minutes walk up the hill, and where Fay and Ramsey provide excellent catering. Then we will provide dinner for everyone at Glandore on the final night before departure. Having had our own very successful guesthouse for twenty years, we have plenty of experience when it comes to good food and catering for a party. Since we only have three apartments (two for two people and one for two/three), the maximum number of participants will be seven. We’re assuming that not every guest will want to paint so the number may well be more like four or five. On the morning that Lois was printing out the letters ready to send, we had our first booking when some visitors, already on the list to receive details, came into the Gallery and decided there-and-then to book for the Painting Week. So we were off to a flying start! Peter Martin is a well known name on Scilly. He’s the shipwright who builds race-winning gigs, repairs boats both big and small, and owns the beautiful classic yacht ‘Shuna of Melfort’. All winter ‘Shuna’ has been at his Boatbuilding shed at Porthloo, safely cocooned on her trolley and protected from the elements by a tarpaulin over her superstructure. Not long ago, from the window of our Gallery, we saw the tarpaulin had been removed and Peter and his wife, Fiona, were working aboard the yacht to prepare her for a season of summer sailing. Her mast was brought out of the shed and set in place with great care and attention to detail. Much polishing and hard work was carried out to get her pristine and immaculate, ready for launching from the slipway. On the hot sunny afternoon of Friday 1st July, Steve went out onto Porthloo beach to continue working on a large beachscape watercolour. During the morning, I had seen a large tractor carefully tow ‘Shuna’ on her trolley down the slipway and onto Porthloo Beach, to await the high tide later in the day. So, late afternoon, I put a notice on the Gallery counter ‘Back in ten minutes. 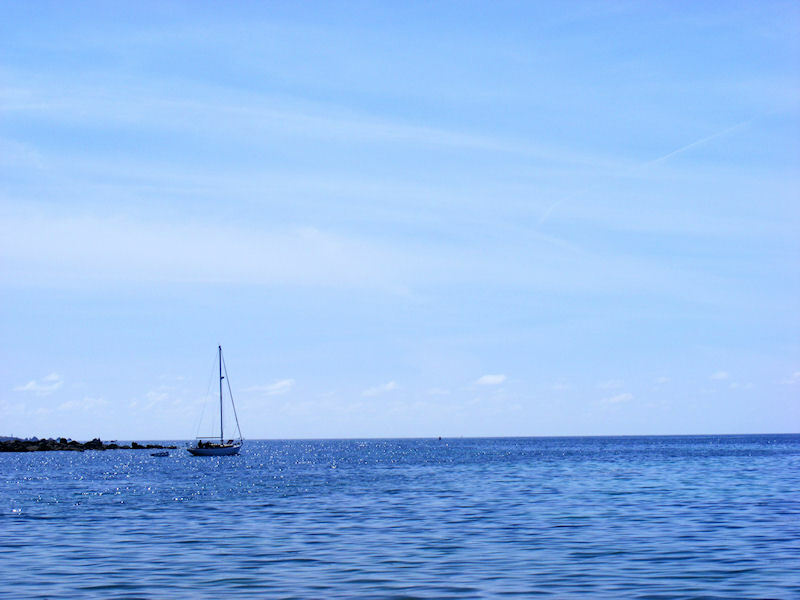 Please feel free to look around’, grabbed my camera and hurried out onto the beach. ‘Shuna of Melfort’ was built by Dewar’s in Bo’ness, Scotland in 1963 and designed by G L Watson. I also found an interesting blog post about the ‘Shuna’ on the Scillywebcam site together with a couple of photos showing the sad state of the yacht when she was salvaged from the Western Rocks in about 1999. Click on the image in the blog post to open it in a new window and you can see the damage she suffered. After nine years of hard work to restore the yacht to its current immaculate condition in 2008, it’s a credit to Peter Martin that she looks so fabulous! 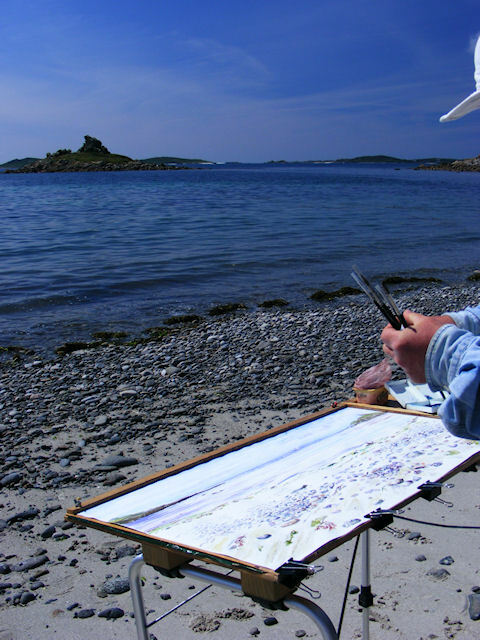 This shows Stephen working on a large watercolour of Porthloo Beach, using his adapted picnic table with adjustable legs for uneven surfaces. It’s heavy but useful.